People from different walks of life are taking part in the campaign, trying to send out a message through art, science or plain logic. When thousands of women got out on the streets against a verdict that said they can all go to the Ayyappa temple at Sabarimala, a part of Kerala watched in disbelief. Here was a verdict from the Supreme Court that essentially said no, you are not impure because you menstruate, women, you have equal rights to enter the temple. And there were women fighting the verdict, echoing what leaders of various Hindu groups were saying, that true believers would not go to the temple. As the protests and conversations around impurity picked up momentum, another hashtag began- ‘Women Are Not Impure’. The campaign was bound to come from someone, somewhere. And it is not just about Sabarimala entry, the campaign. It is also about the decades-long practice of keeping away women when they menstruate. Ardra VS, a BA Literature student from Delhi, belongs to Malappuram and has grown up in a very liberal atmosphere, with parents who encouraged her to read and make beliefs of her own. “That stand (that true believers would not go to the temple) is not correct. There would be a lot of women believers who do not wish to go. But that doesn’t mean you can question the faith of those who wish to go,” she says. 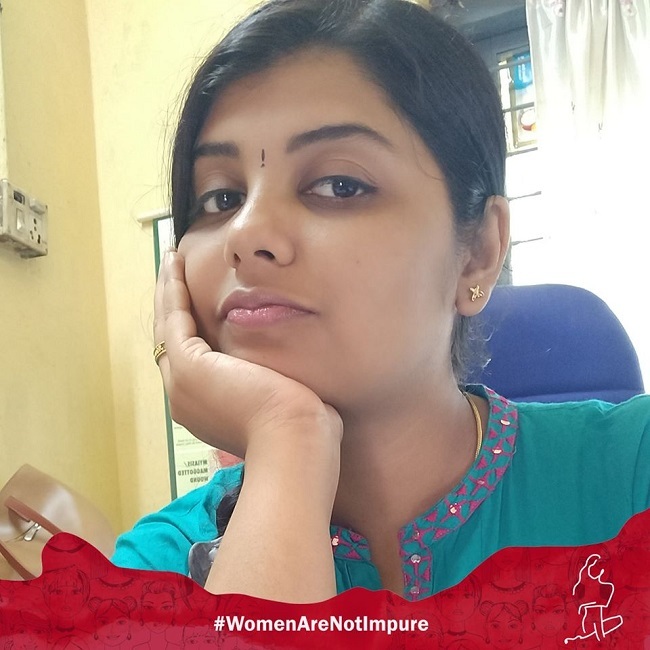 Ardra was one of the first to post on the Women Are Not Impure campaign. “Oh, you are having your period? I shouldn’t have touched you. Now I am impure,” a friend told her on the day she wrote that post. “There are a lot of girls and women among us who have grown up listening to the lessons on impurity from a very young age. It is not that women learnt it on their own, the same men who put women next to purity taught them that menstrual blood is impure,” Ardra wrote on her post. She talks of houses that still follow the practice of keeping women away at the time of their period, not letting them touch anyone or anything that others used. “This is a very old taboo. The campaign is not just connected to the Sabarimala issue. It is just that this is one of those times you should speak about it,” she says. In her post, Ardra, a young woman forming surprisingly clear and broad views from all that she’s read, writes how this impurity connected to menstruation became accepted just the way untouchability was once internalised. She talks about the conditioning that do not allow women to think otherwise and take them to the streets to protest the rights they have been granted. Ardra says she realises that a social media campaign may not make a big difference but it helps take a message further. Her post has been shared more than 200 times, that many people have amplified it. There are others like her as part of a group called Progressive Minds, sharing more stories. 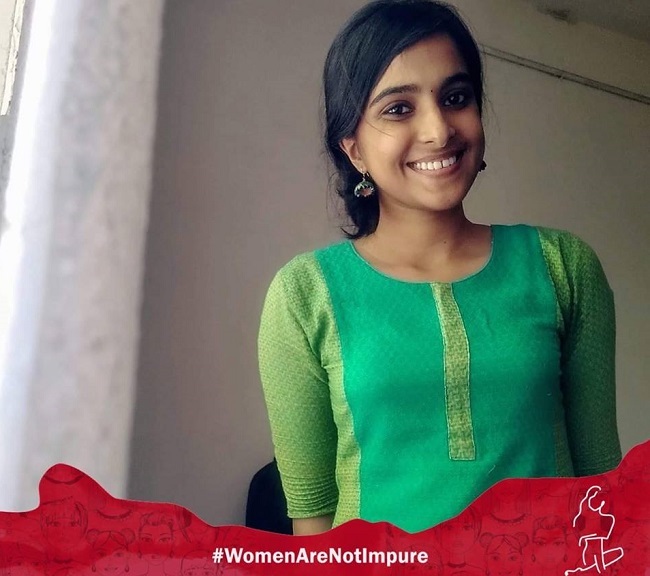 Suvarna Haridas, a veterinary doctor, made a frame for profile pictures – a red sea at the bottom with the words 'Women Are Not Impure'. “There are many reasons for the campaign to start now, but the trigger point comes from two developments – The Congress party’s unexpected support towards the protest against the verdict, and a video put out by Dr Nisha Pillai, a cardiologist from New York, saying it is not right for women to enter the temple, trying to explain it scientifically,” says Suvarna. Another doctor – Deepu Sadasivan – has in fact written a detailed Facebook post, arguing against the points put forward by Dr Nisha Pillai, listing out why ‘women are not impure’ when they menstruate, scientifically. Dr Pallavi Gopinathan of Kottayam Medical College explains in laymen’s terms, giving several anecdotes from the past, how the whole ‘impurity’ concept is a mental attitude. She narrates her experiences as a medical student coming to terms with dealing with organs, how a placenta that she first looked at with disgust was not any longer so by the time she finished her course. She writes how ‘pure vegetarian’ food promised in hotels did not refer to cleanliness when they said pure. It is the mind that should change, Pallavi writes. Along with science, art too has joined the campaign. Durga Malathi, who has been attacked and threatened a lot for her art work on social media, put out two pictures after the SC verdict came. One is of a goddess bleeding, an idol falling down a flight of steps. “That one is from three years ago, but people had taken it away and destroyed it. I only have the picture now. The concept is obvious – that Bhagavati (goddess) is also a woman. She could also be kept away (when she bleeds),” Durga tells TNM. She calls the protest taken out by hundreds of women against the verdict, as one for ‘satisfying the whims of a male-dominated society’. But she understands how they have been conditioned to believe that, how they do not realise this is discrimination. 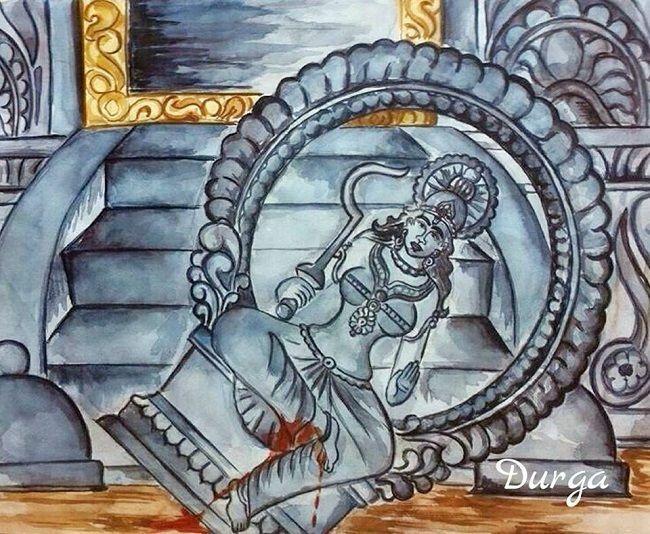 “Even their thoughts are imprisoned,” Durga says. The outcome of the (Women are not impure) campaign may take time to show effect, but Durga is sure there would be a difference in the future, that change cannot be stopped.